While I am waiting for the Sailplane graphics to arrive, I started cycling transmitter, receiver, and ignition batteries and I also changed out one engine yesterday. 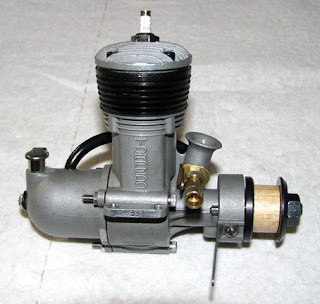 I have been using a Shilen Torpedo .29 ignition engine in the Class B Airborn since it was initially built. However, last year in a discussion with George Tallent out in Arizona, George said I should pick up a Jenno Torpedo .29 because they would outperformed the Shilen engine. Well, I did locate a Jenno Torp .29 (S/N 337) and bought it. 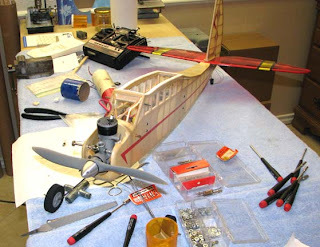 I sent the engine to Bob Beecroft out in California who is not only a free flight modeler, but a good machinist as well. He drilled the three threaded holes that hold the backplate on crankcase all the way through the crankcase so the engine could be radial mounted as shown below. I removed the rear mounted tank, changed out the needle valve assembly for an fine thread Enya needle valve assembly, and installed the Jenno Torp .29 in the Airborn as shown below.